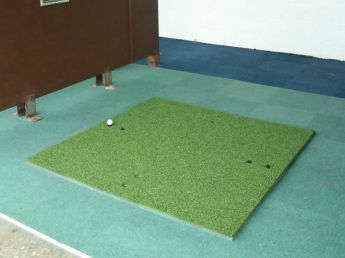 We manufacture our own Professional Golf Driving Mats therefore we are able to pass on the saving direct to you. Each Driving Mat you order comes with 2 different sized tees. Our Professional Golf Driving Mats are the ideal application for the commercial industry or for the player insisting on only the best product for home use. The 30mm mat consists of a three layer laminated foam backed composite. Olive green and tightly woven grass fibres makes our Pro mats a very popular product in the golfing industry. A variety of heat fused holes are made for the rubber tees that we supply with this product.